Hello! Our names are Ofir and Efren, from ISRAEL and SPAIN. We have been in CDO for 1 week (Ofir), and 3 weeks (Efren). 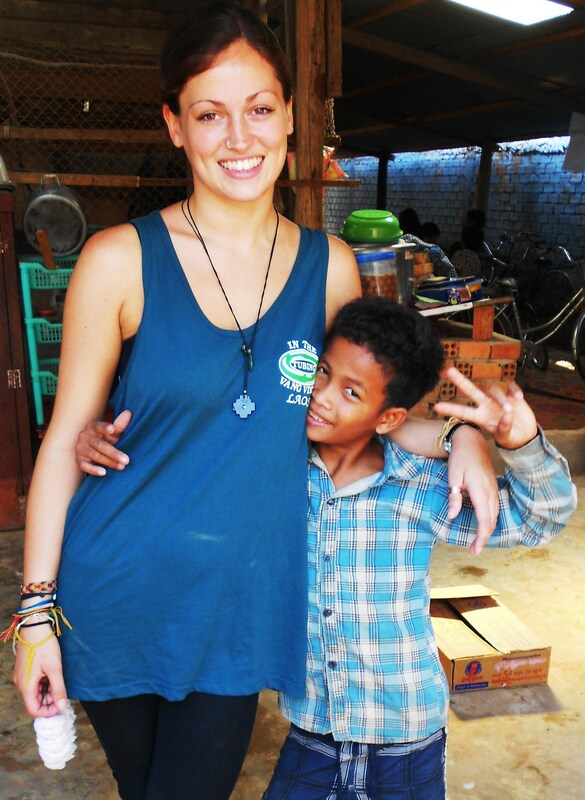 Ofir heard about this place from her friend, who volunteered at CDO one year ago, and when she came to Siem Reap she decided to volunteer at CDO also. Efren, arrived in Siem Reap with the idea of spending not more than a couple of days in the city. 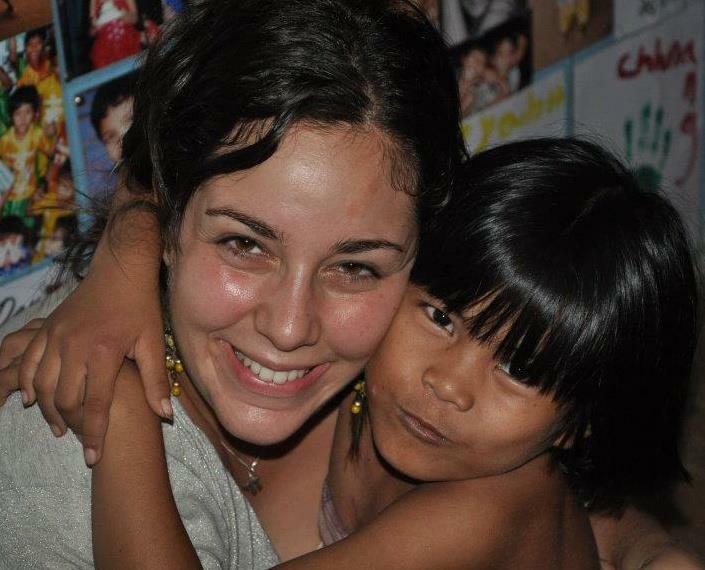 Then met Sara, herself a volunteer at CDO, and decided to stay for another few weeks teaching at CDO. Our experience was amazing, as soon as we entered the school the laughs happiness and smiles of the children made us feel at home. All of this made us stay for more than we expected. 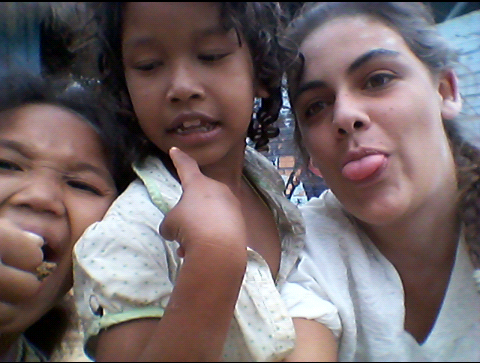 Children here are incredible and they never stop to surprise you. Despite the economic situation from which they come, they show lots of interest in learning, and never stop asking questions. 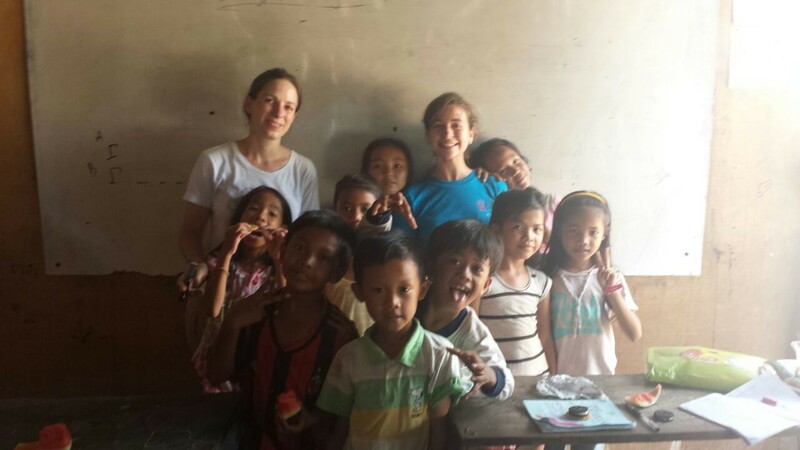 Teaching the kids every day was harder than we thought, but still incredibly rewarding. We didn’t only teach. 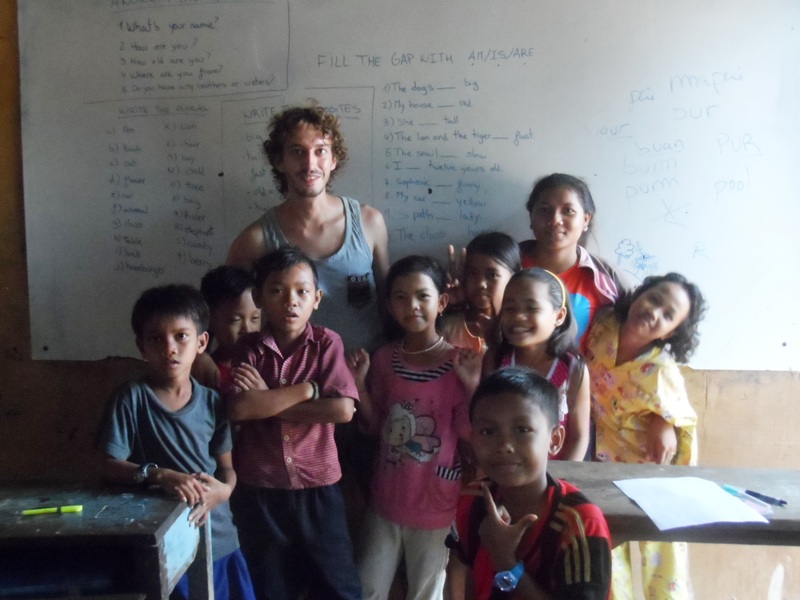 Before, between and after the lessons we play games, jump, run and have a lot of fun with the children. After class is over, we organized and help with the little projects that were going on. 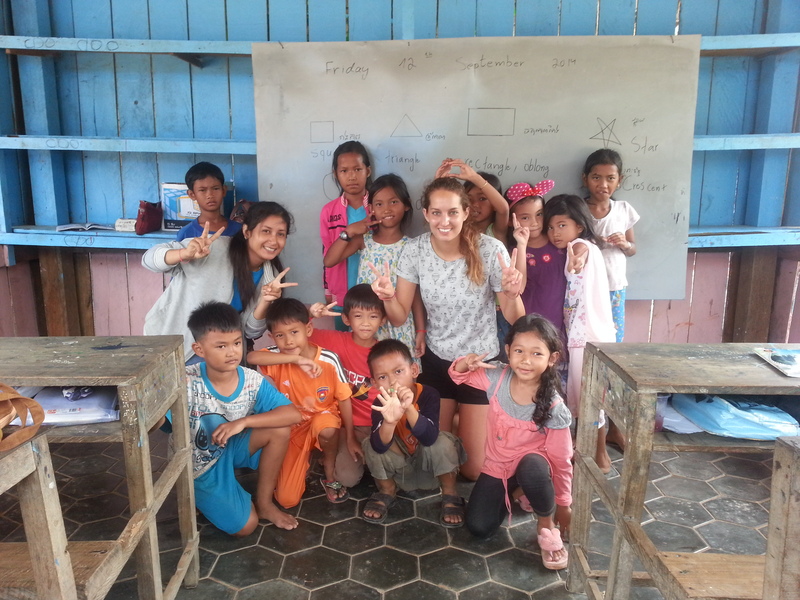 To finish this little review about our experience, we would like to encourage you to volunteer if you ever come to Siem Reap. Like we said at CDO they will make you feel at home. Hello! We are Marie, Lucie and Morgane, three friends from FRANCE! 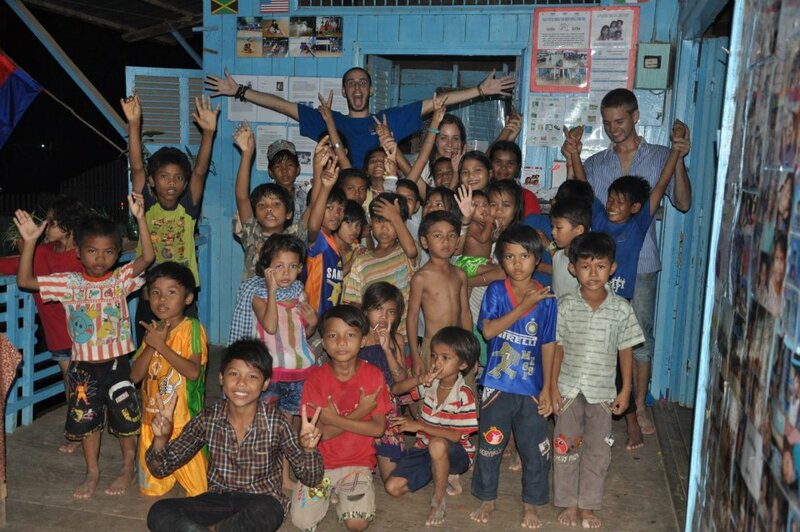 We all are passionate about developing countries, so we chose to volunteer together in Cambodia in the summer 2014. One year before, we had already spent six months in Phnom Penh, where we were interns in th e French Chamber of Commerce. We have been struck by the poor condition of kids in Cambodia, and we felt powerless in front of this situation. Moreover, we found it hard to create strong ties with the local population in Phnom Penh, due to the cultural gap and language barrier. This is why we made the decision to come back in Cambodia: we knew that by volunteering, we could both help the children and make friends from this amazing country! We heard about CDO thanks to a partnership between our French student association Mission Cambodge and CDO, which allowed us to get involved in this great project! 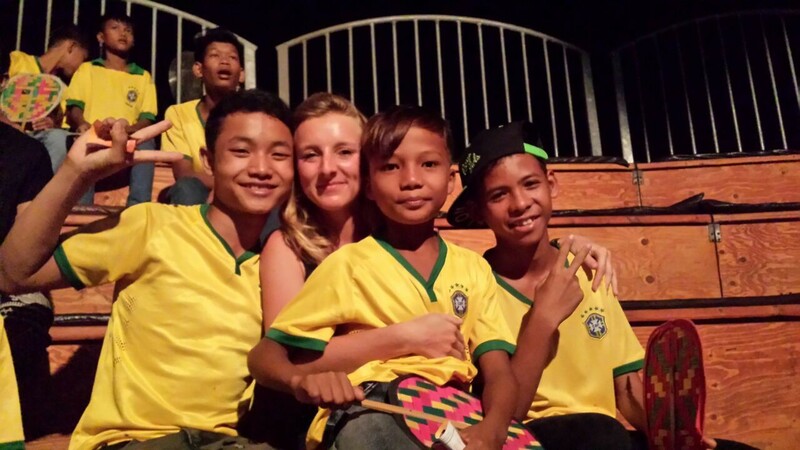 We arrived in Siem Reap at the end of July 2014, and spent nearly one month at CDO, as English teachers. From the first days, we were struck by the huge gap existing between the standard of living of the kids at CDO and the very touristic and superficial center of Siem Reap. That motivated us even more to do our best to help the kids. After one week in CDO, a trip to Leap Chass (the village where most of the kids come from) was organized and we had the incredible opportunity to see our pupils‘ families and birthplace! We got to know better the kids and their environment, and at the same time we got a deeper understanding of how we could contribute to help them at CDO. English classes gav e us the opportunity to interact everyday with many kids: we were amazed by their enthusiasm and energy, which were a source of motivation…but also of tiredness! Some frustration was felt at the beginning in face of the language barrier remaining with some of the kids, especially in class A. We wanted to teach them as many topics as possible, but we quickly realized that things were not absorbed as fast as we hoped! Similarly, our ability to explain the lessons without any knowledge of Khmer was sometimes limited. However this experience was extremely enriching for the three of us. Besides, we supported several other projects, among which financing the reparation of the toilets at the center, or buying basic materials for the kids (such as paper, pens, books…). Our last project is to bring the kids to the Phare Ponleu Selpak Circus, an incredible show organized by a local organization, hoping that it will close beautifully our experience with CDO. We really enjoyed our time at CDO, and recommend this experience to anyone who is keen to volunteer! There was a strong cooperation and motivation among all the volunteers, it was a key element to make things move forward. We have met amazing Cambodian people, the kids as well as the CDO staff: Mom and the Khmer teachers working with us. We had the chance to share a lot with them, thank you for that! Mariana Carnall, 21, PORTUGAL, Mariana spent 7 months at CDO since October 2013 until April 2014 and she just came back for another month. After one day and a half of traveling, and more than 10 thousand kilometers from home, I arrived in Siem Reap, unaware of the fact that the city was well known for its temples, what the CDO family was all about and most importantly what I was going to do. It’s extremely complicated to describe what I felt during the first days in here. I remember feeling constantly nervous and completely in shock by this town, probably due to the fact that everything was different from what I was used to. Besides being a completely jaw-dropping and unknown reality, Siem Reap, was for me a city with two different sides: dark and sad due to the poverty and dirty streets, and, on the other hand, white and bright due to the joy and happiness of the local people, especially the young people. The constant stress of the first days: arriving to a class room, having 15 eyes starring at me, waiting for me to teach them something that would go beyond a simple English class. All of them with impossible names to pronounce, and a linguistic gap that I had never felt throughout my entire life. However, during a brief period and without noticing, everything changed and I had successfully adapted to this distant and different reality. I overcame the difficulties that seemed impossible for me to overcome, the initial shock had disappeared and I started looking at things with a different perspective. The stress I felt at the beginning when going to the class with everything well prepared had decreased, the classes were now more fluid and I had successfully bonded with the students, a special connection that I had never thought to achieve in the first place. I learned to deal with the linguistic gap, and I realized that the way I behave in front of the students is the most important of all. Nowadays I feel that I am much more than a simple teacher in here, and that my work goes much more beyond the classes. The initial anxiety, of wanting to do everything fast and flawlessly just vanished, simply because I have realized that there is always something more to do: Whenever I complete a task or achieve a goal, I add three more. I have learned to deal with it, to be more realistic and I realized that I am just another teacher at this school and in a city where so much more needs to be improved. I can’t believe that I am in this city for only 2 months now, even though time flies sometimes. However, the exceptional reception provided by the CDO and the city made me feel that they have always played a role in my life. Thanks to them, I no longer feel nervous or stressed as I felt in the very beginning. This is, by far, the most important experience of my life, and I can honestly admit that I have successfully embraced this challenge. Siem Reap is my home now, a home I don’t want to leave. Not yet. Jennyfer Dahan, 21, FRANCE. Jennyfer spent nearly 3 months at CDO in February,March and April 2012. Here is her story. We arrive behind this blue gate and where more than welcome by the staff to came in. They explain us everything about the story of CDO and after few minutes we finally met the children, they was finishing eating, I remember how surprised we were by their autonomy to manage to clean their dishes by themselves. Then they came to say hello and we start to talk… Amazing English !! They was so curious, they keep asking questions about everything… I thought ” I am in the right place ” ! Every day in CDO look actually the same, English lessons, Public school, games, lunch, nap, school again, play, dinner, study… but they were all completely different and all special, and on each day I have memories ! After 3 weeks, Mom tell me that the next Saturday we going to Leap Chass Village to celebrate a weeding and to see the parents. I was so excited ! And this day came… we all jump in this big truck ! WAW it was fun, all of us, kids and volunteers ! 2 hours after, we were welcome by the children’s families, some kids but especially the younger ones, run to hug their parents… no words can describe how do you feel when you see something like this. We have lunch all together and we go to the weeding, the kids dance, play they were HAPPY and joyful !!! Everyone smiled, it was amazing !! then the time came to say goodbye… We came back to CDO with such good memories ! After one month in CDO, I just could not go ! I decide to stay almost 2 months more, which was one of the best decision I took in my all life ! Day after day CDO become my home and those kids my family. I get attach to this home more and more every day ! This experience is magic and I mean it, this experience change everything. I met in CDO people I will never forget, the kids for sure, the staff, the volunteers, the families ! I would like to thank you all of them, Alexander Weber who did a lot for CDO, Vilan previous staff and amazing person, Mom and Sakoun (Sakoy 🙂 ) who take care about those angels every days and every nights, all the volunteers and my friends Kevin, Zohar and Julie who share this experience with me the all time. I do not have all the words I would like to have because of the English to say everything I would like to say but I hope you ll feel this happiness that they gave me in my words. If you guys read this, do not hesitate, CDO is not just a simple organization, this is different, this place make you smile and happy every single day ! CDO is a family, with all the meanings of this word. See you soon Heaven !!! Hannah Ainslie, 25, UK. Hannah spent one month at CDO in January & February 2012. Here is her story, half way through her month. “When I initially came here with a girl who had been before, I knew nothing of CDO, but I had been thinking how I should give some of my time to this beautiful country. After intending to stay only a day or so I quickly realized I would be here a while. 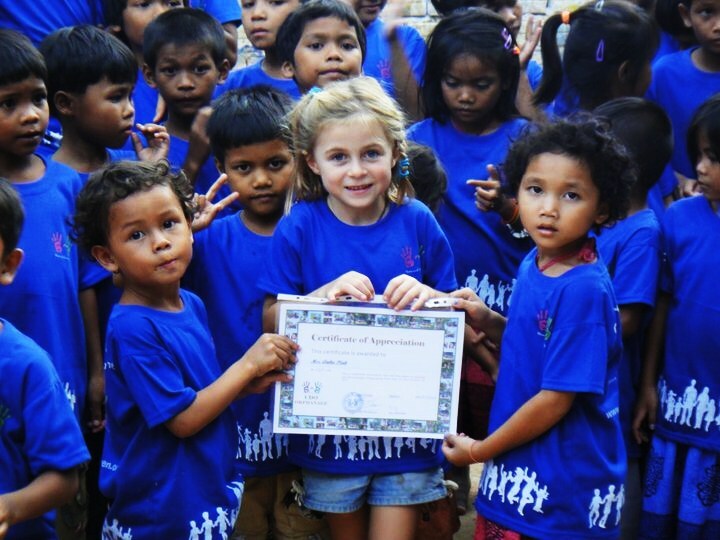 CDO are an amazing organization that have done incredible things, both for the children they care for at the CDO Home and for Leap Chas village, 40 km outside of Siem Reap. The thing that makes them different from other NGOs is their goal to tackle the whole cycle of poverty in Cambodia by helping to give better prospects and establish sustainability, to equip the children with a good stable and loving upbringing and an education that will open their world up to enable them to be an active part in developing Cambodia. My first day at CDO I taught English, which was just charming. I have never intended to teach children back in the UK, but the children here are very well behaved, polite and they’re full of enthusiasm to learn. As soon as you come through the door they’re keen to greet you, ask your name and ask how you are. Working here and spending time around the children every day, I feel a refreshing reminder of childhood; the amount of energy, the positivity and the blissful naivety that it should encompass. After thinking how I wanted to help CDO in any way they needed, from day two I started looking at ways CDO could make themselves more well known, and ways we could increase the amount of donations we receive. While here I have been trying to establish more contacts for CDO from the UK who can help with advice on education and marketing, and I have begun foundations for setting up fundraising events when I get home. This and developing the website is what I’m spending most of my time on at the moment. People who come and volunteer here can offer whatever they can and it is appreciated so much, but it will feel very difficult to leave as feeling part of an organisation like this is something very special, like a loving family. Aside from the work I do here, the experience with the people at CDO is heart-warming. The connection between the staff and the children is exactly how it should be. People are always happy and pleased to see you and the children always come and greet everyone when they arrive home from public school. A couple of times I have been to the local Cambodian markets to help Mom get the food for the CDO home. Local markets are full of life and local culture; a delightful experience. show me the conditions of the village and also the plans we have and the projects we aim for in the future. This experience gave me a good insight into what we’ll be helping with. It taught me the real meaning of the word remote, and how detached rural Cambodia can be. This is a place where there are two wells, with no water filter system and no health care or education. During flooding season the village is very often cut off from any form of road so it becomes inaccessible and any attempt at growing a food source is wiped out. Tina Scherz and her family. 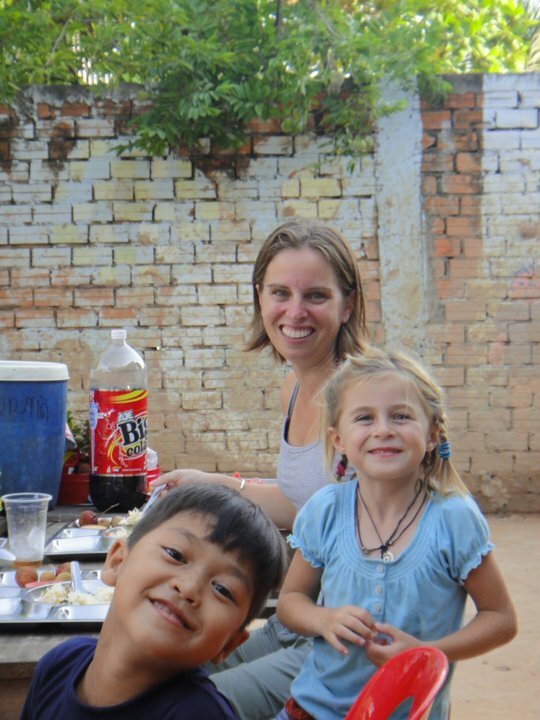 The Scherz family volunteered at CDO in June/July 2011 for one month. Tina volunteered with her husband and two daughters. “In June and July 2011, my family added CDO to the family in our hearts. As part of a year long travel adventure my husband, two girls ages 7 and 10, and I are on, we spent a month at CDO teaching English. Anyone who has ever visited CDO, knows what a pleasure it is to arrive at the big blue house and be greeted by the kids. Their smiling faces and insistent greetings are a great way to start the day. Sharing this experience with my family made it even more special. The girls instantly found themselves aplethora of playmates, as everyone was eager to engage with them, often overwhelming them. But they quickly settled in, helping with the teaching, food preparation, and hauling dirt for the new toilet block that was being built. They learned many new games from the kids, though their elastic jumping skills could never match theirs. In particular, I loved watching the interaction between my girls and the CDO kids. The CDO kids would imitate my kids, adopting their “-isms” or intonation, and sharing jokes that sometimes only kids can appreciate. I want to support all of children at cdo ,but now i just a student i’m not ability to help them so if in the future i have ability i will support them.Thank you!